Sometimes, it takes seeing a design element in action to convince you to implement it. 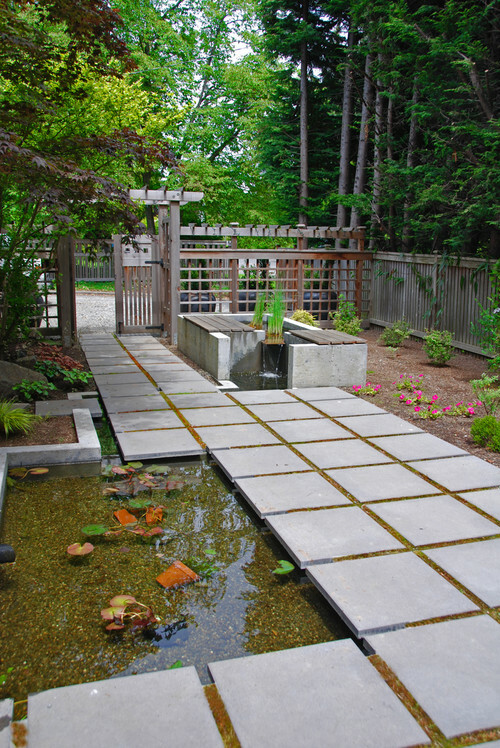 Though there are many applications in which concrete pavers play a starring role, they do shine in Japanese and zen gardens alongside a variety of other plants, structures, rocks, and water features. We’ll explain the aesthetic principles of Japanese and zen gardens. Along the way, we’ll show you examples of how homeowners across the globe weave them into their yards. Due to space constraints in many Japanese homes, the gardens are typically small. However, materials used often represent larger things in nature. For example, a rock can symbolize a mountain or an island. Bonzai trees are another perfect example as perhaps a giant tree isn’t practical for the homeowner. Design elements are often hidden and revealed as one moves through most Japanese gardens, unlike a zen garden (as we explain below). You’ll never see everything in one glance as with each change of direction there is something new to please the senses. Japanese gardens integrate views and existing structures into the overall design in order to make the garden seem larger than it really is. This lends to an overall cohesive look that embraces nature. 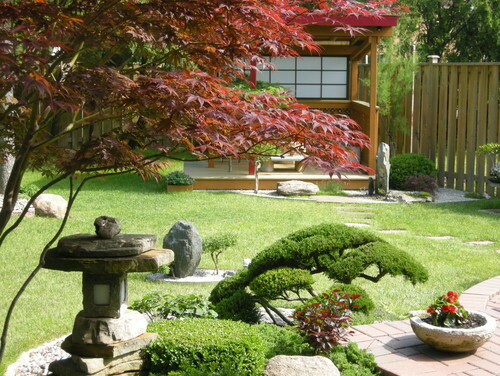 Nature doesn’t possess exact symmetry so neither does a true Japanese garden, though modern homes these days utilize straight lines to complement Japanese or zen garden features. There also isn’t usually one focal point. Large structures are placed to the side or softened by trees or bamboo. Overall, the garden should appear to be wild, but immaculately manicured. 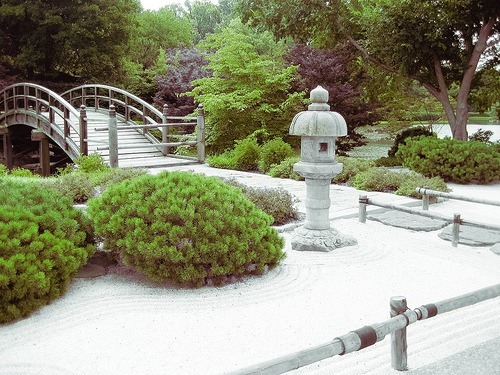 What’s the Difference Between a Japanese Garden and a Zen Garden? The real answer is nothing, because a zen garden is a style of Japanese garden. The term zen comes into play because the gardens surrounding Buddhist temples are minimally-designed to encourage meditation and reflection. However, in the West, the term zen garden and Japanese garden are often used interchangeably without any distinction. However, there is one major differentiating factor when it comes to true zen gardens (also called karesansui or Japanese rock gardens). One should be able to see an entire zen garden from from one or two vantage points in order to prevent the mind from wandering. A wandering mind doesn’t meditate well. Sand is often used in zen gardens to represent water, the beach or the sky. Raked patterns imitate ripples, the overall tranquility of the beach or even clouds. White sand symbolizes purity but any color is considered acceptable. Note that the design above incorporates the zen principle of being able to see most of it the yard at one time, without clutter. The single, sturdy rock in the sand was deliberately placed to potentially symbolize a few things. One is that rocks and water (represented by sand) have a balanced yin-yang relationship. Rocks also symbolize sacred islands thought to house deities. The pavers laid in a subway pattern provide a nice walkway surrounding the sand and pool while also complimenting the raked pattern. 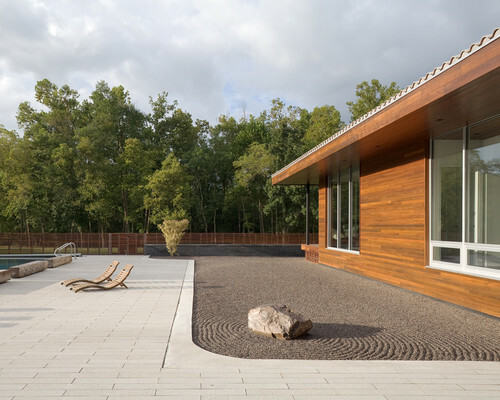 The use of multiple elements is striking in this yard, including the gravel walkway leading into the paver patio area as well as the deliberately-placed large rocks, manicured trees and flowerless plants. Even though everything is out in the open and not totally concealed the eye is prone to browsing every detail. 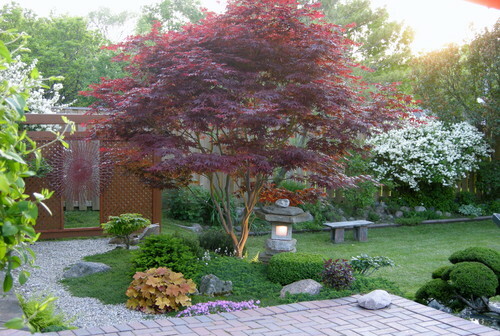 Without the lattice wall and sculpture, the Japanese maple tree would certainly be the focal point. Instead, balance prevails. This gorgeous Japanese garden incorporates a small teahouse. As the name implies, tea ceremonies traditionally take place in these structures though they also make an excellent meditation spot. Notice that from this angle, the Japanese maple tree softens the teahouse, reached by stepping stones leading into the grass from a small paver patio. 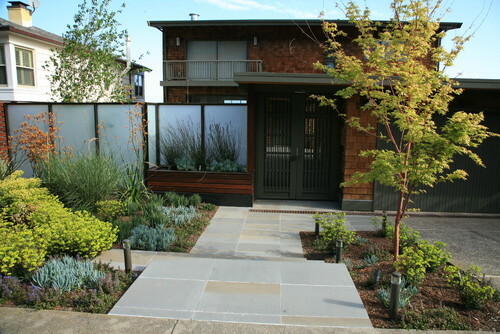 As the transition point from the outside to the inside of your home, the yard’s entrance is one of the most critical details to pay attention to in a Japanese garden design. From this point, it’s important to consider what you want each visitor to see as they enter. This homeowner chose to place a fountain near the gate. 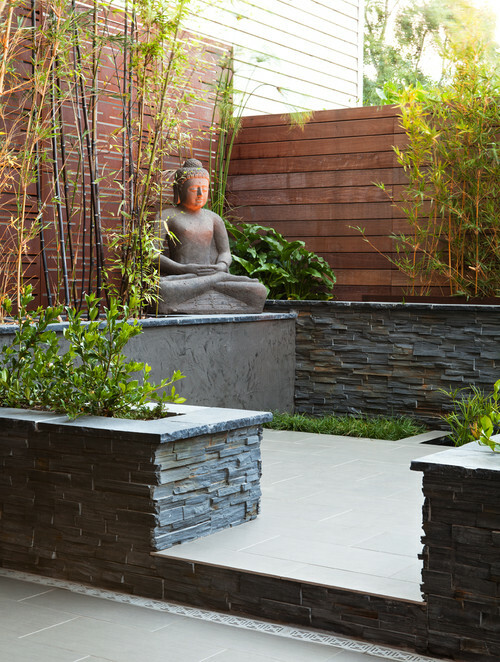 Water and stone (which can be represented by concrete pavers) are considered to have a balanced yin-yang relationship. Japanese gardens also often possess two connected areas of water, as seen above. The water flows peacefully under the walkway. Bridges made of stone or wood represent the transition from one place in life to another, or the path to immortality. Either way, they’re just pretty to look at. Bridges in Japanese gardens can be arched or flat, but they are rarely painted. The design above uses blue river rock to simulate water, which is very common when the real thing isn’t practical. The brick colored pavers add warmth to the design, especially next to the river rock. The use of koi fish feature in Japanese gardens is actually adapted from the Chinese. Koi are domesticated carp that are specifically bred for color. If allowed to breed naturally, they’ll revert to their natural colors. Considered a symbol of good fortune, they one of the most recognized elements of a Japanese garden despite being finicky to care for. Pagoda-shaped lanterns (seen in a number of these photos) also date back to ancient times as they once lined Buddhist temple walkways as a light source. Moss is used to signify that the garden is ancient. Pines represent longevity, due to the long needles. Lotus are sacred in Buddhist teachings so are considered acceptable flowers to use. Tree growth is controlled by trimming to give an ornate, ancient look as well as prohibit trees from overwhelming the garden. Common trees and plants found in Japanese gardens include Japanese maples, pines, azaleas, camellias, sakura (cherry), gingko, Japanese cypress, and bamboo. 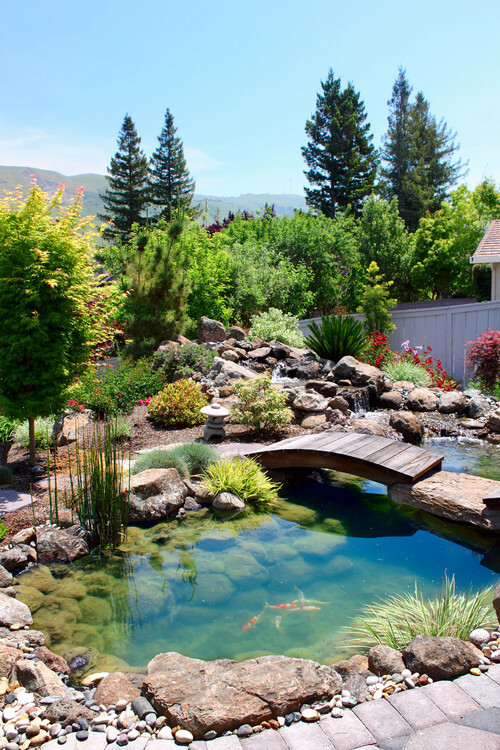 To be honest, we didn’t even scratch the surface regarding the various styles of Japanese gardens since most homeowners tend to implement only certain elements. Remember, any garden decor or plants can be considered zen if it calms your mind and that pavers play an integral role in these gardens, as you can see in the photos above. 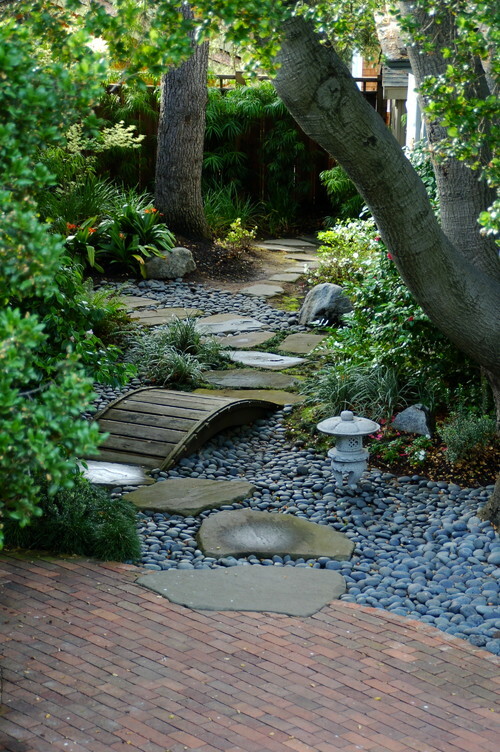 Do you have Japanese or zen garden elements in our yard?